Search Our Inventory / All Rugs / 12&apos; 9" x 19&apos; 8"
As every significant home requires one or more antique carpets on a grand scale, we maintain a plentiful selection in sizes from 11' x 15' to 18' x 30'. 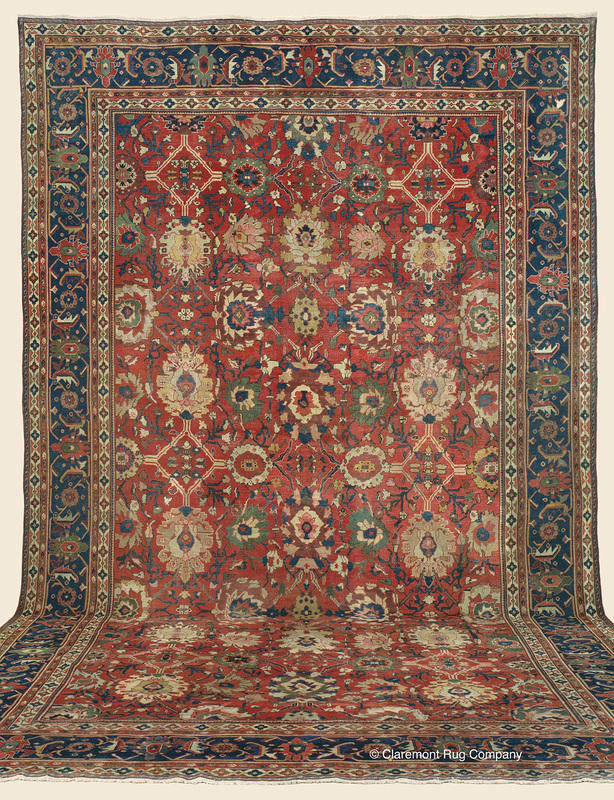 One of the many standouts of our current collection of very large carpets is this 170-year-old Sultanabad masterwork with its continually reinvented pattern and endlessly nuanced colors. The patina of great age is magnificent, revealing the profound depth that emerges when these natural craft-brewed dyes have softened for many years. The allover palmette design is remarkably spacious and fitting for a carpet of such expansive dimensions, permitting the viewer to become enveloped in its artistry. Continuing the quiet, gracious warmth of the field, its cobalt-grounded border provides a heightened contrast to the shimmering buttercup, mossy green, taupe and guava highlights expressed in the field.